Clarence Clemons, the larger-than-life saxophone player for the E Street Band who was one of the key influences in Bruce Springsteen's life and music through four decades, has died. He was 69. Clemons died on Saturday night after being hospitalized about a week ago following a stroke at his home in Singer Island, Florida. Bruce Springsteen acknowledge the dire situation earlier this week, but said then he was hopeful. He called the loss "immeasurable." 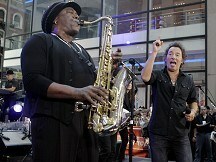 Known as the Big Man for his imposing 6-foot-5-inch, 270-plus pound frame, Clemons and his ever-present saxophone spent much of his life with The Boss, and his booming saxophone solos became a signature sound for the E Street Band on many key songs, including Jungleland, a triumphant solo he spent 16 hours perfecting, and Born To Run. But his health seemed to be improving. In May, he performed with Lady Gaga on the season finale of "American Idol," and performed on two songs on her "Born This Way" album. An original member - and the oldest member - of the E Street Band, Clemons also performed with the Grateful Dead, the Jerry Garcia Band, and Ringo Starr's All Star Band. He recorded with a wide range of artists including Aretha Franklin, Roy Orbison and Jackson Browne. He also had his own band called the Temple of Soul. Born in Norfolk, Virginia, Clemons was the grandson of a Baptist minister and began playing the saxophone when he was 9. He published a memoir, Big Man: Real Life and Tall Tales, in 2009 and continued to perform.